New single from artist Phresh LaRosa, from Pittsburgh PA. 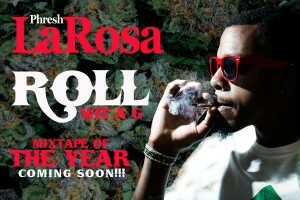 I am submitting his newest song “Roll (Wit A G)” off his upcoming mixtape “Mixtape of the Year”. 2012 has been a very interesting year for the music world, which we saw some major names producing some top material but an even bigger year for independent artists who have emerged out of nowhere and broke out. Pittsburgh’s very own rising star, Phresh LaRosa, has been steadily making a name for himself working on his projects and performing at a variety of places. The artist has just recently released a brand new song from his upcoming mixtape entitled, ‘Mixtape of the Year’. A perfect arrival for this summer. The mixtape will be coming out soon, along with a music video release July 13th. Until then, check out ‘Roll (Wit A G)’.